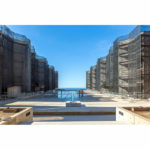 The Salk Institute opened in La Jolla, California, in 1963, with striking buildings of concrete and earthy wood lining a travertine plaza and overlooking the Pacific Ocean. But within a few years, the buildings began to weather badly, causing unsightly effects that led to inadequate conservation efforts. 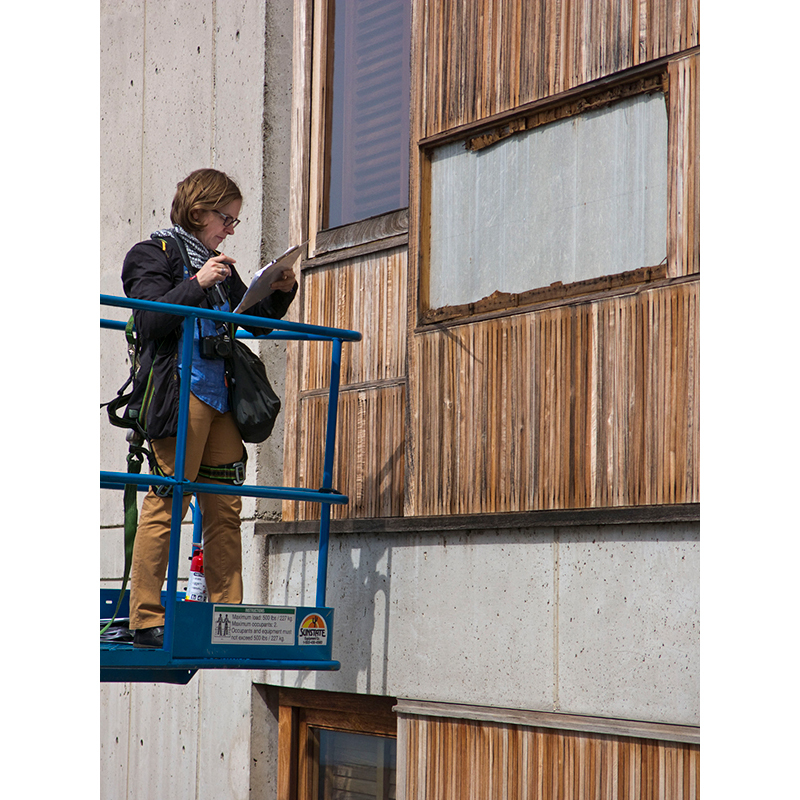 In 2013, fifty years after the Institute opened, the Getty Conservation Institute began a multi-year process to understand the challenges posed by aging, repair the damage, and plan for the future of the site. 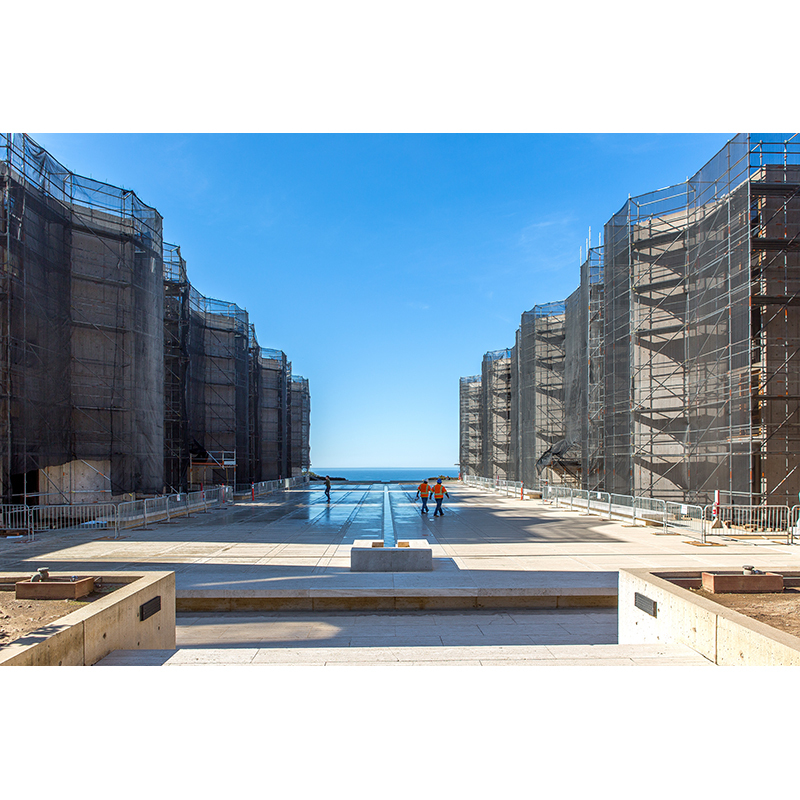 In this episode, Susan Macdonald, head of Getty Conservation Institute Field Projects, and Thomas Albright, Professor and Director of the Salk Institute’s Vision Center Laboratory, discuss the conservation of the Salk Institute and the architecture’s impact on the science performed there. THOMAS ALBRIGHT: And this place, of course, is a temple, devoted to the natural world. And that symbolism of the movement of the light— The light is always moving on these buildings. And every day it’s the same, and every day it’s different. CUNO: Last episode, I spoke with Nathaniel Kahn and Jonathan Salk about their fathers, architect Louis Kahn and medical researcher and developer of the polio vaccine, Jonas Salk. 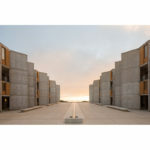 The two men collaborated on the design of the celebrated Salk Institute, which opened in San Diego, California, in 1963. 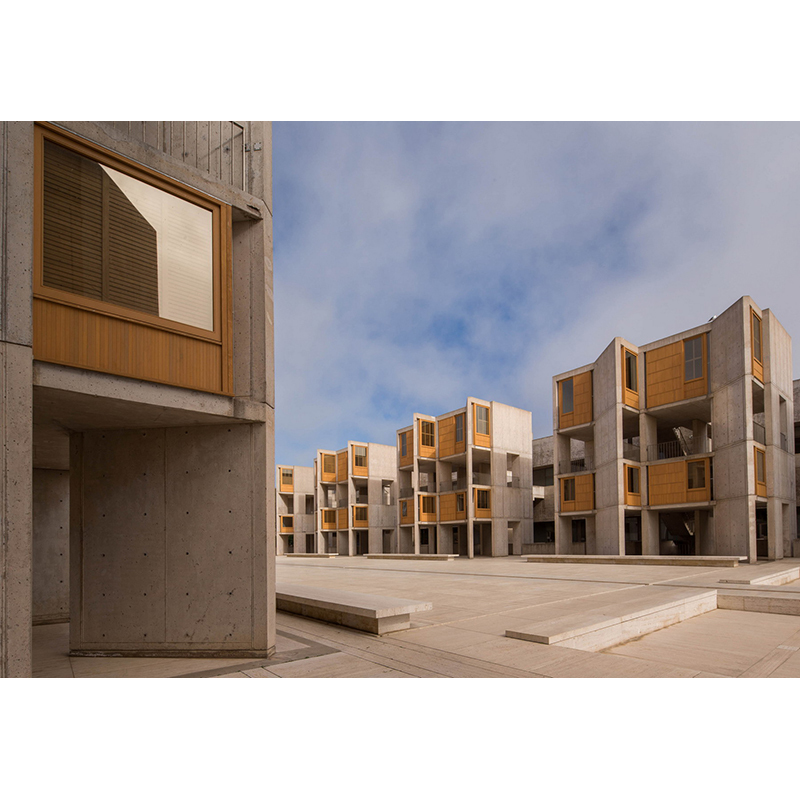 In this episode, I discuss the recent conservation of the Salk Institute buildings with Susan Macdonald, head of Getty Conservation Institute Field Projects, and Thomas Albright, Professor and Director of the Salk Institute’s Vision Center Laboratory. In 1957, Jonas Salk, developer of the first safe and effective polio vaccine, conceived of a research institute that would comprise a collaborative environment where, as the Salk Institute describes it “researchers could explore the basic principles of life and contemplate the wider implications of their discoveries for the future of humanity.” Six years later, on 27 acres of land overlooking the Pacific Ocean and with buildings of great dignity designed by the visionary architect Louis Kahn, the Salk Institute for Biological Studies opened its doors. Over the years, the maritime setting has taken a toll on the Institute’s buildings. 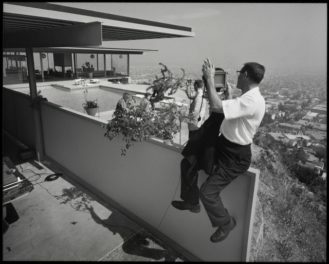 And in 2013, fifty years after the Institute opened, the Getty Conservation Institute partnered with the Institute to analyze the state of its buildings and plan for their long-term care. I visited the site and spoke with the Getty Conservation Institute’s Susan Macdonald and Salk scientist Thomas Albright to learn more about their work. Okay, I’m here with Susan Macdonald, head of the Getty Conservation Institute’s building and sites department; and with Tom Albright, professor and director of the Vision Center Laboratory at the Salk institute, and founder and former president of the Academy of Neuroscience for Architecture. We’re in Tom’s study, and we’re learning more about the work of the Getty at the Salk Institute. So Susan, tell us how the Getty got involved in this conservation project at the Salk Institute. SUSAN MACDONALD: Sure. So we had not long launched our Conserving Modern Architecture initiative, in 2013, when we were approached by some of the members of the staff here at the Salk Institute for Biological Studies, who were about to embark on a really major project here. Probably the largest project to the external elevations and— and the building itself since it was completed in 1965, to repair or replace the teak window wall systems. And there was a number of challenges that were arising as a result of that intention. And they were really interested to see if we might be able to provide some advice or to help them in this endeavor. And at that time, we were thinking that we’d like to have another field project. We had our first field project at the house of Ray and Charles Eames. And we were just really quite excited by the idea that we might be able to somehow support the work that might be undertaken here at this really incredible building, because of course, this is a really important piece of architecture, internationally and in California. And the idea that we might be able to help introduce the whole concept and methodology of conservation to the stewardship and long-term care of this building was something that we thought was really worthwhile and could have implications and messages for many other institutional owners of great works of modern architecture. CUNO: So you were approached by the Salk? MACDONALD: Yes. In fact, two of them came to one of our lectures, one of our public lectures. And after that, they came and said to us, “Look, we’ve got some challenges here. Would you be interested in coming to have a look and coming and help us?” So we came down and we had a look. And of course, for many of us who’ve known this building for a long time, it was a bit of a dream, really, that you might be able to actually help influence what might happen here or support what was happening here. This is a place that’s had great recognition and love for this building over a long period of time, and some careful stewardship, and careful asset management. But one of the things that we thought was interesting, and interesting for a lot of buildings of this age—it was fifty years old; it was coming up for its first major repair—was how conservation might provide the solutions to its long-term care and helping with some of these challenges. The challenge that they had at that time was that there were some severe problems with the teak window wall system, and so they had an urgent need. Evidently, parts of it were falling off the building. CUNO: And I read somewhere that there were 203 teak window assemblies. MACDONALD: 203, all slightly different. And the initial proposal was to take them out and to replace them all. And we came and had a look, and we felt quite strongly that conservation could be a solution here. Because there was a potential for that project to have a really major impact on the building, not only in terms of loss of its authenticity or integrity and original fabric, but also the impact of what might happen and what it might do visually to the coherence of the building. So we thought it was a great opportunity to introduce an institution to the idea of conservation, how you might embed that in your day-to-day asset management, and apply that to a current problem on a major repair project. So we quickly came to an understanding. One of the things that we look for in a partner is whether our values might be aligned. And we felt that there was something of a meeting of the minds here, and that we might be able to have a good relationship. And so we quickly developed this idea of doing a project with them to help them address this immediate need, but with the longer-term aim of really helping them understand how conservation is the way forward for stewarding this building into the future. CUNO: So Tom, how did this impact your work here at the Salk? Was it a big disruption? Was it something that you and your colleagues were behind from the beginning? THOMAS ALBRIGHT: I think we were all behind it for all the obvious reasons. The teak was in terrible shape, and something had to be done about this. But it was a big disruption for, I think, nine months or so. There was scaffolding all around the courtyard; there were shrouds, black shrouds. Our president at the time, Liz Blackburn, said it looked sort of apocalyptic. As you come into this place, it’s just extraordinary, and covering it with a black shroud is an unusual experience. We had to be routed in certain directions around the building while all this was happening. There was noise, there was dust. Actually, I was surprised. The dust was minimized by the shrouds. But it was, nonetheless, a disruption. But we were all— as I said, we were all very enthusiastic about doing this. I’d been here over three decades and I’ve watched this teak deteriorate over that period of time. There’d been efforts in the past to wash it and treat it with oil. I think those efforts were not very sound, and the oil did some damage to the wood; the washing did damage to the wood. And so having it in this pristine form that we have now is just extraordinary. It changes everything. CUNO: Yesterday we talked with Jonathan Salk and Nathaniel Kahn about their fathers’ work together, in collaboration of the conception and execution of this project. And it was on the focus of the relationship between the arts and the sciences. So Tom, we’re in your study here at the Salk this morning. How does this building inspire you, or how does it work for you? ALBRIGHT: Well, this is one of the biggest questions—I’m a neuroscientist, so I’ve had this long interest in how a building affects the mind of the inhabitants of the building. We build buildings for lots of reasons. They provide shelter, they keep the bugs out, and the rain. But they also are designed to move people in certain ways. And this building, for reasons that I can’t clearly articulate, moves the people that work in it. Now, I can give you lots of examples, practical examples, of how the building facilitates the science. But there’s something beyond that. There’s this, you know, expression in architecture, the spirit of place. This place has a spirit of place. We all know buildings that have that quality associated with them. I’ve been to many buildings where I’m just overwhelmed when I come into it. This building does that. When you walk in from that east gate, the place just captivates your attention and moves you in some important way. And I’ve been coming in here every day for many years, and it still does this to me. And I think that in some way, affects the science that I do. But it’s a part of the brain that we have very little understanding of, the sort of emotional response and how that emotional response engages positive behaviors. CUNO: So was that in danger of being compromised by the poor condition of the teak? ALBRIGHT: I think so. Although when you come in from the east building, you don’t see it the way you do from the western point of view. But yes, it’s been said. There’re a number of things associated with the building. There was a problem with the channel of water down the center a few years ago. And so that had to be dug up, basically, and the travertine had to be replaced. And it turned out it was impossible to find travertine that’s exactly the same patina and color as the travertine that’s been there for decades. You can see this when you come in. I notice this all the time. I don’t know whether people new to the institute find that a problem when they come in. They may not. But it is something that bothers me. CUNO: You mentioned Elizabeth Blackburn, the previous president of the Salk. And she’s quoted as saying, “You have the brightest people working in one of the most collaborative and inspiring environments, so maintaining a long-term conservation plan for the building is incredibly important.” So that seems to be at the core of this project, right? And Susan, was it Elizabeth who approached you or—? ALBRIGHT: Actually, it was prior to Elizabeth Blackburn’s time, so it was Bill Brody at that time, who was the president here. And it was he and his team that were very keen to get the Getty involved, and thought we could bring something to this project. CUNO: So when they approached you, you had to consider when the teak was last analyzed and treated, before you got to work on it. MACDONALD: The teak has had various treatments over the years. So very soon after the construction of the building, there started to be some challenges with the window wall systems. There were some leakages and there was a black biofilm that appeared quite quickly. CUNO: Yeah, how did that happen? MACDONALD: Well, what we discovered in our work was that there was a difference between what was actually designed and what was actually built. So when we looked very carefully at the shop drawings from the construction of the teak window walls, we discovered that everything wasn’t implemented in the way that it might’ve been expected to. And perhaps I could take a step back and just mention something about the window walls, to set that up a bit. The teak window walls were prefabricated, so they were built off site, but very carefully designed by Kahn’s office. And then there were shop drawings prepared by the carpenters from the shop who were making them. And what was really interesting when you looked at that was that it was this wonderful sort of synthesis of industry and craft, in that these were prefabricated units that were gonna be built off site and slotted into this vast concrete frame. But crafted in a way that was really quite extraordinary. The level of detail was really extraordinary. And so when we went back and looked at the archival drawings and discovered what was actually meant to be in there and what was built, we realized that there were some things missing. And the fundamental things missing was that the flashings that had been designed around the window walls weren’t there. And we discovered that that had been value engineered out, very late on in the project’s life. Because there was some severe budget cuts that had to be made at a certain moment, and so at the last moment, they took out a lot of the flashings. And so the building actually started to leak quite early on because of that. Because most buildings need flashings to be put in them. And the biofilm that then developed quite quickly, within eighteen months of the project being finished, was black and disfiguring. And that was quite disturbing to Jonas Salk. He was very concerned about, one, that there were some problems with the window walls; and then secondly, that there was this black biofilm forming. And that happens because of where you have water, you get the fungus growing. CUNO: Does it have anything to do with the material itself, with teak? In other words, if another wood had been used, would there have been the same problem? MACDONALD: Well, teak is a really durable wood, so the choice of wood was actually the right one. It was just that there was water sitting in places on the elevation that— where there shouldn’t have been water. We were then able to sort of reverse engineer it, by looking at the architectural drawings. And then when we took one of the windows apart, we realized that was the problem. And so we learnt a lot about what was causing the problems. And the other thing that we did is we went back and talked to a lot of people about what happened over the course of the building’s maintenance. And as Tom said, some of the previous treatments hadn’t been good. So very early on in the history in the building, a coating was put on the building, because it was never meant to have a coating. Kahn’s vision was that the teak would weather naturally and turn gray. CUNO: [over Macdonald] To turn gray like the concrete. MACDONALD: But that didn’t really happen because of the water issues and then the biofilm. So they put a coating on it quite quickly. Now, when you put a coating on a natural material, it’s got a finite life and it’s going to start to weather off. And so it would weather and then they would replace. And it’s going to weather differentially because you’ve got different elevations and different environmental issues happening. And so it had various treatments over the years. And probably the most damaging one was when they were using wire brushes and chlorine, at a certain moment, because when you put a bleach on the building and then use a wire brush, it opened up the teak more, to more damage and deterioration, and accelerated the damage, and then created more space for the biofilm to actually colonize. The biofilm doesn’t actually harm the teak. It’s not eating the teak. But it quite likes the water and the things that the water carries with it, and it likes some of the things that were in the previous coatings. And some of the treatment, the more recent treatments that they’d put on was what that did was turn the teak pretty much bright orange, which was really abhorrent to— I think it was really a huge contrast with the concrete itself. And so progressively, these treatments had got darker and oranger, and so there was this great contrast in the teak, where the coating was still on it and where it wasn’t. And then there was a great difference between where the coating was and where it was deteriorating. So on some of the windows walls, you’ve got— half of it would be bright orange and the other half of it would be gray with black. So it was quite disfiguring and it did disrupt the overall visual harmony of the building, if you like. You stopped reading the building in its monumental and very kind of noble form as a piece of architecture, and your eye was going to these sort of damaging and discolored areas of the material. ALBRIGHT: I think that’s exactly right. It was such a visual distraction. You know, it got to the point where it just went right over my head, because I’m here all the time. But I imagine with people coming to the institute to begin with, this sort of spotty appearance of the teak, took away a great deal from the harmony of the structure, how it otherwise would’ve been—how it is now, for example. CUNO: You know, we’ve talked a lot in our previous podcast about the special relationship between the architect and the client—that is Jonas Salk and Lou Kahn—and about their particular partnership and their mutual commitment to the relationship between art and science, for example. And therefore, that’s one of the reason why there’s so much attention paid to the building and how important the building in— not only in appearance, but in the way it informs the work of the Salk Institute itself. Tell us about that, from a scientist’s point of view. ALBRIGHT: Well, there’re a couple of things that are worth point out. One is that especially today, science changes at such a rapid rate. There’re new techniques, there’re new people, there’re new laboratory, new students, and we have to be able to accommodate that. And if you build a building that doesn’t have flexibility, then the science sorta gets stuck. It gets sort of contained by the building, in a way that’s not optimal. This building is extraordinary in part, because there’re no structural walls in the interior, and there is the full-height pipe space above each floor. So when you create a new laboratory, you have to put in new plumbing, new electricity, new communication lines, new gas lines and whatnot. And all this is facilitated by the ability to go up and move stuff around on the full-height pipe space floor. The other really important thing about the design of the laboratory floors—again, stemming from the fact that there’re no structural walls in the interior—is that the laboratories just sort of merge into one another. I’ll use as a contrast a typical laboratory building over at the University of California, across the street, where you go in the building and you walk down a hall. On either side of the hall, there’re doorways that enter laboratories. The hall is, of course, the common corridor. And it’s, in that sense, wasted space. 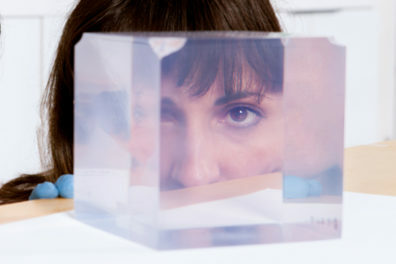 But it also is a barrier to interaction between the laboratories. And having the laboratories just merge into one another, as they do in this building—again, facilitated by the lack of structural walls—enables people from different laboratories to run into one another, in ways that wouldn’t happen otherwise. And in the process of converging, they meet one another, they start up conversations, they realize, for example, that they might be working on similar things, but coming at it from a completely different perspective. And this is where new science is born. It’s those sparks at the boundaries between these laboratories. I think of the laboratories as like little communes. And so we each have a little commune on the floor, and we abut one another, and that’s where the sparks fly. And that’s where new things happen. I’ll also say that in the laboratory next to mine— This has been a tradition. Terry Sejnowski has been a colleague of mine here at the Salk Institute for thirty years. And Terry’s lab has always been right next to my laboratory. Terry brought a tradition from Harvard, which was tea every afternoon at 3:30. And so every afternoon at 3:30, for the past thirty years, we’ve had tea in Terry’s lab. There’s a big sorta common room in Terry’s lab where this happens, and there is a table, a little bit bigger than this table, which we call the tea table. And somebody is assigned every day, the task of making tea. And people come from all around, all the adjacent laboratories, and just accumulate there, and lots of discussions ensue. During the period of time when Francis Crick was here, Francis was enamored of neuroscience, and most of us down in that area are neuroscientists. And so Francis would come to tea and I mean, you can imagine. You know, this was the most important biologist of the twentieth century, sitting around chatting with you. Francis would always take bets on when we were gonna figure out how consciousness works. We haven’t gotten there. And many of the bets that were taken twenty years ago, the dates have long past. But it was the nature of conversation. But the general point is that this was an area, it was a space that was, again, facilitated by the open structure of the floor, that facilitated the science in a really important way. It gave it flexibility, it gave it the opportunity to grow in directions that would be constrained by a typical laboratory building. CUNO: Now, we’re sitting in your study, which is for you alone, so you can remove yourself from the laboratory into a study to do some further conceptual work or some reflection on what was found that day in the laboratory. CUNO: Tell us how the study works for you. ALBRIGHT: Oh, I use it for exactly that purpose. I don’t use it as much as I used to. You know, I have a prime piece of real estate here at the Salk Institute; I’m on the third floor, the courtyard level, on the west end of the building, and on the courtyard side. My laboratory has lots of light and it looks out onto the courtyard and the ocean. And so I like being there. But I’ve always had the policy of having an open door in the laboratory. And so a consequence of that is that somebody’s at my door every five minutes. You know, “What about this? What about that? Can you help me with this? I need a, you know, a solution to this problem.” And I like that. But every now and then I have a task to do. I have a grant to write or a paper to finish, and I need a little quiet time. And so I come up here. And it is actually, in part, because of the beauty of the place. The aesthetics of this setting here, this gigantic window looking out at the sea and the sky and the— I love the raw concrete. And it is inspiring. And it gets back to this issue I raised earlier about spirit of place. I don’t know how this happens, and I wish I did, and hopefully, someday we’ll figure this out. But there is something that goes on, some sort of facilitation of creative thought, when you’re in an environment like this. CUNO: Mm-hm. Well, it’s in your study where the exterior of the building meets the interior of the building. CUNO: And it meets it through the window treatments, through the teak itself. So that gets us back to the conservation project. And Susan, there were two phases to the project. Talk about those phases and the difference between them. MACDONALD: Yeah, so our project had— we were primarily involved in two phases of work. And the first phase was really just the information gathering stage. Like, to really understand the building, the teak, the problems, and why they were happening, and then develop some solutions and thesis for what could happen. And our whole project was driven by this idea that you didn’t need to replace all of the teak, that it was possible to conserve a large amount of it and to do a thoughtful and careful conservation project. And one of the primary principles of conservation work is you have minimal intervention and you only do as much as necessary. And that’s one of the drivers for it. So our first phase of work, the first thing we did was really just look at the building. And we did a very quick analysis and condition survey of all 203 window wall systems, just to sort of get a feel of what was the overall condition. Was it the same everywhere? How many of these window walls were really in dire straits? And which ones of those were actually pretty much okay? CUNO: And what kind of conversations did you have with those who do the science work here? CUNO: Where the Kahn archives are, yeah. MACDONALD: That— Yeah, where Louis Kahn’s archives are, and talked to the archivist there, Bill Whitaker. We’re also really fortunate that we were able to talk to Jack McAllister, who was Louie Kahn’s project architect for this project as a young man, who was still alive when we started the project. And that was really wonderful. We did an interview with him to really try and understand what had happened on site and why certain decisions were made. And then from that, we then come up with what is important about this teak. What’s the contribution to the building and this place overall? How does it contribute? We did very detailed drawings where we sort of had to analyze exactly what was going on. We opened up one of the teak window walls so we could understand what its pathology was, if you like, and how it was constructed. MACDONALD: …is another thing. And it was Tectona Grandis, which is Burmese, old— mainly old-growth teak, and some— a little bit of plantation teak. Which was important because obviously, some of it was gonna be replaced. And that was one of the challenges [inaudible]. CUNO: [over Macdonald] Tell us about the difference between old-growth and plantation teak. MACDONALD: Old-growth teak has had more time to grow, and so it’s a much more dense material and is much more durable. And plantation-grown teak, of course, is grown for harvesting, and so it tends to be grown more quickly. And so one of the things that we were really keen to do was to try and preserve as much as much of the old-growth teak as was possible, because you’re never going to have as good quality teak as was sitting on this building. We knew that if you tried to replace this teak with plantation teak, it’s very hard to get anything near the teak of the same density, and therefore durability and longevity. And so we wanted to try and preserve as much as possible, and then we had to work out where we could find sources of teak. CUNO: You told me yesterday about the ethical issues that have to be taken into account when you do source teak. Talk about those. MACDONALD: Well—and I think this was something that wa— had been concern of the institute, actually, when they were faced with this problem. That if you want to use the exact material that was on this building, old-growth teak, you can’t get that anymore. The only way you can get old-growth teak is to get reclaimed material. Or if you want ethical sources, that is, because you can get old-growth teak, but it’s been harvested probably illegally. CUNO: As a source for the teak, yeah. MACDONALD: …in Burma, as a source for that material. And so in the end, they were able to source a very high-quality planation-grown teak to replace it. But at the end of the project, they only required replacement of 30% rather than a hundred percent, which has been originally proposed. CUNO: ’Cause you could reuse existing teak? MACDONALD: Because we could reuse it. And that was our thesis, really: How do we conserve most of the material, do a very sensitive repair here, retain the integrity of the building? And so through that scientific research, we also wanted to know what the biofilm was, because rumors were that it had something to do with the kelp forests offshore. We’re sitting in a maritime and coastal environment here. But in fact, it’s a fungus that colonizes on the eucalyptus trees, which are all around this particular area. So we were never gonna be able to, you know, eliminate the potential for that. CUNO: But was there any moment when you thought about another kind of wood that might be used, that might similar in color and hue to the teak but wasn’t teak, that might’ve not had the same problems the teak had? MACDONALD: Not really, because teak is a really good material, if you could get replacement teak. And also, it would be very difficult to match up the original material. So if you want to try and keep as much of this as possible, then it’d be very difficult to introduce another timber here. And so from all that initial phase of work, we had a good feeling about what was important. How important was the individual components of this window wall system. So we did very careful sort of axonometric drawings that show how the whole thing was put together. And that was where the archival drawing part came in. We could compare what we had with what was meant to be there, and realize that we had this challenge with not having the weathering strips in. So we identified what was important, what should be kept, what shouldn’t be kept. We spent time talking to the Salk, obviously, their facilities managements, about what their performance requirements were. And from that, we developed the second phase of the work, which was to trial a number of different proposals to see what would work. So we saw a parallel with scientific research, actually; that you have a problem, you have a sort of thesis, you gather knowledge and understanding, and do research to understand it, you trial it. It’s an iterative process going backwards and forwards, and then you finally get on and have your outcome. So the trial phase of work was really important because we were able to trial a number of different scenarios. One from where a teak window wall might actually be in really good condition and needed very minor repair, just some cleaning, some minor replacements; and then could we introduce some form of waterproofing or flashing to help keep the water out of the building and off the building, so we could get rid of the biofilm problem. And the areas that are most exposed, obviously, have the most problems with water. And in those areas, you’d had water penetration and a lot of the stud internal framing had been largely destroyed by termites. So there were some window walls that were in really terrible condition and being held on by a few bolts. I mean, fairly precarious situation, which made the project very urgent. So we did trials from the least intervention to one that was probably gonna need to be taken out completely. So we had the best-case scenario, minimum intervention; the worst-case scenario, where you had to take them out and rebuild them in a shop with a lot of new material, retaining as much as you can. And then you had something in the middle, which was an in situ repair where there was a fair amount of replacement and repair that had to be done. And what we wanted to trial there was, could we do this without taking them out? Could we retain as much fabric here, but create a window that actually works and didn’t leak, et cetera? And so we did that work, and through that, we were able to refine the ideas. And at that stage, the institute brought in some architects and engineers, Wiss, Janney, Elstner, who were our— a US firm who’s got a very good reputation in doing preservation work on historic buildings, including modern buildings, and had a lot of expertise in trying to solve these technical problems. So they came in at this trial phase. And then at the end of that, the institute went on to their phase three of the works, which was the implementation and the project itself, where they actually further refined some of these methods, did their specifications and their drawings, and then worked with their contractor, Rudolph and Sletten, to actually implement the whole project, based on all of this work that had been done before. CUNO: Now, much is made of the Salk itself as where craft and industry meet. And that’s both in the concrete and the teak, this kind of a humble wood meeting the industrial concrete, with the concrete treated in such a way that it seems to have been sort of manmade. And that we talked yesterday about how Lou Kahn liked to talk about the concrete as molten stone. This sense of having a history to it itself. So Tom, when you’re surrounded by this, and all the care and concern given to the teak, how does this sense of craft and industry play into the science and the way that you think about the work you do? ALBRIGHT: It was very much like what goes on in science today. It’s a combination of craft and industry. The ideas are part of the craft. Science, especially biomedical research, advances very rapidly today. In part, because of industry, the development of new techniques, new machines that can do stuff faster, make types of analyses possible that weren’t possible previously. But still, we need the ideas; still we need the craft. You need somebody who is willing to put the pieces together in a craft-like way, as though you were working in an architectural studio or an art studio or a craft studio, in which you have machines, you have industry to help create the substrates; but it all has to be crafted together. And that’s very much like this place. CUNO: This place, you mean the study we’re in right now? ALBRIGHT: The study we’re in; but I mean [Cuno: The whole place] more broadly, the [Cuno: Yeah] the site, this building. CUNO: So Susan, what’s the overall conservation management plan for the building? MACDONALD: By Louis Kahn. And also the Indian Institute of Management, that had some interactions with that institution, too. So they were familiar with Lou Kahn’s work. They had a deep reverence for it. And they do very careful conservation planning work. And so they had this international team working to develop the conservation plan. And the idea was to look at the whole place holistically and understand its significance as a whole. How all these different components of it contribute to this strong sense of place, and what the short, medium, and long-term care of the place should be as a result. And so that’s now being completed. So we were running these two things in parallel. And so that was a little bit iterative, too, because we were looking at one component, but we had to consider how that teak related to, of course, the whole site and the whole place. There was some interaction in the development of their thinking and our thinking at that time. And so they now have that to guide them moving forward. And that was one of our aims, really, was to, through the lens of the teak window wall project, was to introduce the institution to this concept, to this methodology. And then we were really pleased that they went on to develop a conservation management plan which is, you know, for a longer term and more holistic vision for how you might conserve and treat the building in the future. It was a really wonderful progression of the project. CUNO: Yeah, well, let’s go outside and look at the project. So Susan, we’ve just come outside from Tom’s study and on the great plaza of the Salk Institute, and we can see the work that you’ve undertaken on behalf of the Salk, with regard to the teak and concrete and— Tell us about this now. SUSAN MACDONALD: So when you look up at the windows now, all conserved and repaired, hopefully, you cannot tell that we’ve been here, in a way. So we’ve tried to undertake the work in a way that really retains as much of the original fabric as possible, but has introduced some very subtle design changes to cope with some of the problems that were being experienced. So what we’ve been able to do is to clean them, to do some minimal repairs to replace any severely damaged fabric. And then if you look at the top of the system, you can see a very fine metal line, which is an introduction of a new flashing system to waterproof them. And you also have that at the sill, which you can’t see from here. And one other really subtle design modification is that between the sill and the vertical boards, you note that there’s a bit of a shadow line. And what we did there was just cut a very fine amount of fabric off the bottom of those boards to stop the water wicking up from the sill. And we put some epoxy material on the bottom of those boards there to stop of the water wicking up. And that’s all an attempt to stop the biofilm recolonizing on the façade and to help shed the water better. The other thing that you’ll see is that they’re fairly uniform in appearance now. They’re all this natural-looking wood color, the same color as the teak is inside. All of the teak has had a coating on it. And that was a really interesting discussion and there was a lot of trial and error in that, because originally, Lou Kahn designed this not to have a coating and for the teak to just weather naturally to a soft gray, and to blend in with concrete. And so in a way, you wouldn’t have noticed the difference between the window walls and the concrete. But very quickly on, because of the problems of leakage and the biofilm, it became really quite unsightly. And so Jonas wanted to retain that more uniform appearance. And so the question for the institute was, what do we do here? And what they recognized was that the teak’s a natural material. It’s gonna weather; it’s gonna weather differently, depending on where it is in the building. And whilst we’ve gone to some trouble to keep water off the building as far as possible, you were still gonna have some water. So there was still the potential for the biofilm to come back, in a more minimal way, hopefully. And also, we had the issue of having— piecing in new bits of teak, which whilst we were trying to get as good as match possible, there’s a difference between the new and the slightly weathered teak. And so in the end, they decided to put a coating back on. We trialed lots of different materials, to try and work out which ones weathered the best, which one was more durable, which one didn’t create as much harm when you had to clean it off again and retreat it. Because if you put a coating on here, you’re going to have to retreat it. We also wanted to know how long it was gonna last, so we put a whole lot of mockups up on the roof and trialed all these different materials, and eventually selected one which was a matte, which was a much more subtle in color, which didn’t require a lot of difficult and sanding to get it off when you have to retreat it, and would last as long as possible. So what we have now is a much more uniform appearance, because the project was only finished a year ago. So it’s started to weather and settle in, and I think it actually looks nice, now it’s weathered in a little bit. It’s slightly less uniform and you are getting the variations in the material coming through a little bit more. And so time will tell how often it is that they need to maintain it. But now what happens when you come into the plaza is that your eye looks at the whole composition of the place; whereas before, you would come in and you’d see this very uneven appearance and your eye was drawn to this black biofilm and a huge variation in the teak, and it lost some of that nobility as a great plaza in quite a monumentally-scaled-looking building. And here you see now the articulation between that vast scale and the smaller study spaces, and the teak that articulates those quiet, reflective spaces for the building. CUNO: Tom, so now being outside looking onto the teak from the position we’re standing in the middle of the plaza, what do you think of it? ALBRIGHT: Well, as we were saying earlier, the previous condition of the teak was such a distraction. A distraction from the beauty of the building. I mean, a visual distraction. You come into the place and your eyes are drawn to the splotchy patterns of the wood. And now it’s this highly textured, this beautiful patina associated with the teak, the sort of richness of the color and I love the way that that plays off the raw concrete here, and the travertine. I’m sure this is the way it looked initially, and this is the way it should always look. CUNO: What about the eucalyptus grove? ALBRIGHT: Well, until about twenty years ago, there was a grove—largely eucalyptus trees, some acacia trees—a wooded area just to the east of the main building here, east of the plaza. And when one would arrive at the institute, one would park in the east parking lot. You would walk through the eucalyptus grove, this sort of quiet wooded path, and come out and come through the gate to this extraordinary sort of austere courtyard, with the Pacific Ocean at the far end. The contrast of that with the wooded area was just extraordinary. CUNO: Was it like going from outside to inside, in some kind of way? Like a sanctuary of some kind? ALBRIGHT: I think that that’s right. The space here, although it’s technically outside, has an inside feel to it. Because we’re surrounded by the towers and the north and south building, and the gate on the eastern end, and the Pacific Ocean on the other side. I often think of this as though it’s a stage. So you come in from the east side and the proscenium, is down at that end. And the towers themselves are almost, I think both figuratively and metaphorically, like curtains drawn back from that stage. And on that stage, every day, plays out one of the greatest acts of nature, the movement of the light across the sky. And this place, of course, is a temple, devoted to the natural world. It’s where we study the natural world. And that symbolism of the movement of the light— The light is always moving on these buildings. Every day it’s the same, and every day it’s different. CUNO: So in addition to all the teak and the work done on the teak, there is— has been, or there’s a need to have work done on the concrete. Talk about that for us. MACDONALD: So whilst the teak project was underway, the engineers and architects agreed with the institute to do some of the high-level concrete repair works, because the concrete in this building is really quite extraordinary. Again, very beautifully crafted. And I think in the previous podcast, there was a discussion about the care that Lou Kahn took in the creation of this building and the careful selection of aggregates and the material quality of the material that he’s used here. And that care meant that the concrete at this building is actually really high-quality concrete. It’s actually in pretty good condition, generally. However, all concrete with reinforcement in it—this is a reinforced concrete building—eventually can have some challenges. Because as moisture and air penetrates the concrete and gets to the reinforcement, it starts to corrode, and it expands and the jacks the concrete, and you get spalling. So there has been, over the years, various attempts to try and repair the concrete. And if you look around, you can see strange white splodges opposite, for instance, here, of an uneven nature, and the color doesn’t match very well. So whilst they had the scaffold up, they decided to do some of the more urgent high-level concrete repairs here. And so they worked very carefully with Wiss, Janney, Elstner, who have a lot of expertise in concrete repair for historic buildings, to try and develop the method for how you could do this repair, select the aggregates. And they developed a palette of different color, color matches to do different patches around the building, because the color does vary, according to when the concrete was poured and the orientation and the way the light hits it. And so they did some very carefully-crafted repairs here, and some trials to develop the methodology, and then put them in place. So that just took that past that emergency phase. But there are further works that are needed to deal with some more repairs around the building. 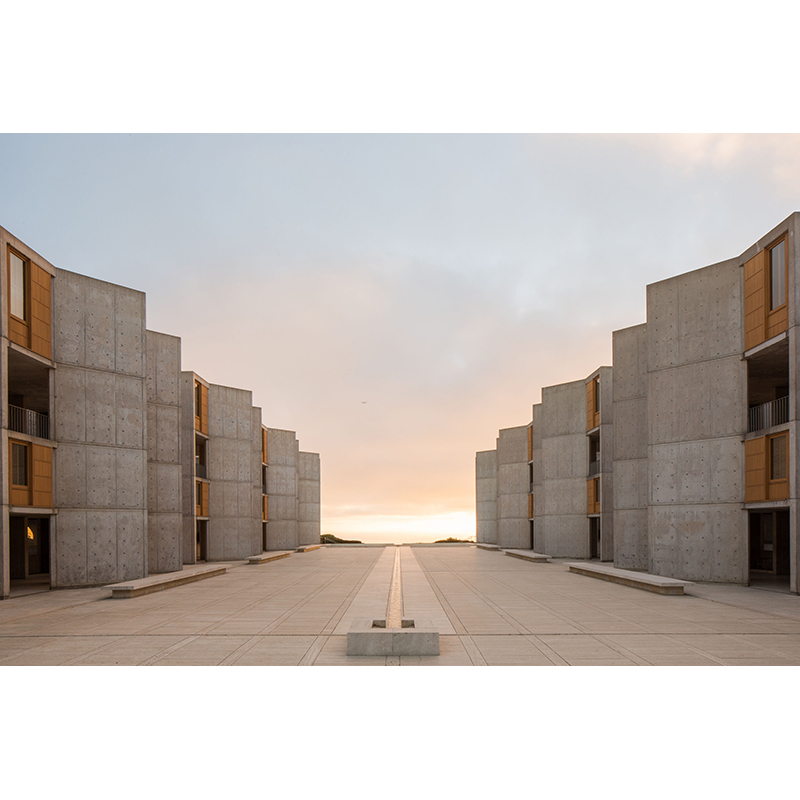 And the Salk Institute applied for another Keeping It Modern grant, and was successful in getting a grant to implement a phase of concrete repair works that they will undertake, following this methodology and careful research that they’ve done before. So where we’re standing here, if you look up, you can see some of their attempts to do these small repairs at the top. The color’s a beautiful match. MACDONALD: They will age. And one of the things that will happen is that there’s a lot of cement paste on the surface, and that will weather off fairly quickly and it’ll start to blend in a little bit more. But I think they’ve been really successful in introducing this much more rigorous approach to doing the concrete repair that the institute can now follow. And really looking forward to seeing their future works to do the concrete repair. It’s a very difficult thing to do concrete repair work of these exposed concrete buildings, where the material is so much a contributor to the characteristics and quality of the building. It’s very challenging. CUNO: I mean, it is a fifty-year-old buildings. The materials do look slightly aged, but they look aged like a— I don’t know, like a leather sofa gets aged. MACDONALD: I think that’s true for this building, that one of the things that is often a challenge with conserving modern buildings is that people want them to sort of look pristine and minimalist. And in fact, they were meant to age, as well. And I think Lou Kahn was one of those people who anticipated and enjoyed that idea, that a building could age and develop a patina and a quality about it. And I think this building is testament to that. And it looks quite beautiful, that variation that you get in the concrete and some of the weathering that’s occurred. And that’s a natural process, and it’s inevitable it’s gonna continue for both the teak and the concrete. CUNO: Yeah. Gives you some sense of life being lived out here. You know, that this is something that isn’t foreign to human habitation; it’s a part of human habitation, because you age with your buildings. MACDONALD: I think that’s right. It settles in and it’s a bit like it achieves a level of comfort with its materials, and for Lou Kahn’s buildings, this material characteristic and quality and how they might change over time, I think was something that he wasn’t afraid of. And I think this building really does that very well. When we talk about sort of the noble ruin, this building as the noble ruin, I think it’s been able to age really quite gracefully. But at the same time, when you look at the concrete, for example, if you look at how carefully it was crafted, and you’ve got those vertical and horizontal lines that were discussed in the previous podcast by Nathaniel, as being very carefully crafted in the building, look how crisp they are. MACDONALD: They’re incredible. They’re just so beautiful, still. They still help provide some articulation in that quite, otherwise perhaps, severe façade. You’ve got a texture to it that brings it down to a more human scale. Which once again, I think this building sort of plays with scale a lot. We’ve got this very monumental large scale, but then we’ve got a much more intimate— these intimate studies, the large scale of the laboratories. And then you see it playing out in the fabric itself, in the concrete, the teak window wall. There is a texture that is very much part of its character. CUNO: Susan, Tom, and I were joined on the plaza by Jonathan Salk and Nathaniel Kahn, sons, respectively, of Jonas Salk and Louis Kahn. Jonathan and Nathaniel, we spent a lot of time yesterday in the house of Jonas Salk, talking about the project, and now we’re here at the project. We were here late yesterday afternoon and we were talking about the effect that the plaza has, of seeming to be both monumental and intimate. And sometimes you lose the sense of scale of the plaza and the walls of the structure around the plaza. And when yesterday we were here, there were people who were sitting on the travertine benches and so forth, and all of a sudden you had a scale relationship. And it seemed very peculiar and it made them seem miniature, relative to the grandeur of the monumentality of this project—which is not a monumental building in structure; but in scale, it is monumental. JONATHAN SALK: The thing that really strikes me being here today, after talking about it, is you know, we’re here on a very overcast, gray day, and how there’s sort of this infinite variation that happens with any change in the sky, with any change in the water, with any change— you know, makes it a living, experiential, sort of infinite organism that you appreciate newly every day. The classic view of this is bright sunshine on the plaza, you know, the contrast with the teak. But today, it’s like this wonderful unity with nature, because there’s very little transition between the sky and the building and the sea. They’re all in subtle gray hues. And you know, it’s one of the fantastic things about this building. CUNO: Tom, you talked about in your office, you talked about the sort of community of people working here at the Salk Institute and how they work together to advance the various scientific studies that they’re undertaking. You get a sense, too, of a kind of quiet privacy of it, too. There’s a sense of contemplation about this building. ALBRIGHT: Yeah, I’ve always been amazed by the courtyard itself. I mean, the courtyard, I think the original idea of the courtyard was, it’s a place where people would commune. But in fact, on most days, there’s hardly anybody out here. Occasionally, there’re tourists who come in and walk through. But the courtyard is a quiet space, a sort of a reverent place, a place where people sometimes sit around the edges. There’s very rarely any sort of large activity happening out here. Sometimes when people finish their thesis, they jump into the pool at the far end there, and the security guards come running. But most of the time, it’s a very quiet space. CUNO: Tom, you talked about some of the institutional claims on resources and the sort of competition for those resources, and that maybe that’s one of the reasons why this marriage between, or this dialog between the science and the arts has been complicated. But maybe there’s some small contribution that the Getty Conservation Institute project here has made, which is to call attention to the values of the aesthetic dimensions of the building or the project. ALBRIGHT: I think that that’s true. And I know this was Jonas’s original idea, to make this an institute of science and arts and humanities. For a variety of reasons, this hasn’t taken hold. I find that regrettable. There’ve been a few efforts in the past to bring people here who represent other disciplines besides the sort of hard biological sciences. There was an effort a number of years ago to bring David Hockney down. And David spent the day here. He’s an interesting man, and very interested in the brain and visual perception. And that’s my area of expertise. So we spent a day with David, talking about how visual perception works, at the level of fine detail. And those are very hard questions to answer, much harder than explaining why you see things in certain colors or patterns. But it was an example of how a scientist with the right perspective and an artist with the right perspective can come together and think about things in different ways and inspire one another. I’m sure that if you were to poll my faculty colleagues, you’d find that they all appreciate the beauty of this place. They’re inspired by it; their work is better for it. Bu, as a day-to-day practice, they’re focused on getting their science right. And so the resources get directed to that. There’s not an infinite amount of resources these days, especially to do this kind of work. So even though we’d all recognize the importance of the aesthetics, the beauty of this place and how it influences us, on a day-to-day basis, this doesn’t get the kind of attention that it deserves. And I think having the Getty conservation plan here really does call attention to the significance of that. MACDONALD: I think for us, the idea of this as a place of science has been really important. And we, in a way, think of that coming together of art and science and conservation as being one of the places where that does come together. And maybe that’s overly simplistic. But the way I was just talking about the making, or the remaking of these window walls, that is a result of understanding it from a sort of building science point of view, and bringing the art or the design quality to it, and through recognition and understanding through history. So I always think of conservation as a bit of a merging of those things, and it’s through the act of conservation where these disciplines at least come together. And I think for us, we’ve been tremendously proud to be involved here because this is a very special place. Not just because it’s a beautiful work of architecture, but I think as you have all talked about, this place has a spirit of place. And one of the questions for us as conservation practitioners is, how do we articulate that spirit of place, that very difficult thing? How do you identify it? How do you then work out how to preserve that? And for me, that’s one of the really interesting aspects of conservation, ’cause we haven’t exactly worked out how to do that yet. Because you can deal with the fabric and you can, you know, have good visitor management, and you can deal with the technical things. But how do you retain that essential quality, that spirit of place that makes something extraordinary, rather than just good? And I think that’s something that we’re kind of continually searching and thinking about how to do that. And so projects like this give us an opportunity to think about that some more. So I think it’s been a challenging project; I think it’s a really important one for us; and we’ve been really proud to be a part of it, and hope that we’ll be able to retain some sort of relationship moving forward, as well. SALK: You know, one of the stories I heard from some of the conservationists, was that when they got news that they were gonna get this project, people cried. I mean, and it was, you know, just so moving. Talking about it in the spirit of place, I just wanna articulate again, the thing that Lou and Jonas had, which we all at times rolled our eyes at, was this sense of spirit. NATHANIEL KAHN: I do, coming here, especially with you, Jonathan, I think of our fathers and what they believed in and what they dreamed about together. And I think these ideas are more needed now in our world, when everything is for sale. And you come here and you stand in this court, looking out at the sea, with the continent behind you, infinity out there, under the sky—no money can buy this. This is experience. And that’s what really matters in human life. They created a place for us to experience that. I hope people come here [laughter] to experience it, ’cause it’s really special. And it’s free.